To some people, changing the oil in your car is just like changing the oil in your motorcycle. Just drain out the old oil, install a new oil filter, and pour in the desired amount of new oil and you're done. So when it comes time to change your motorcycle oil, why can't you use the same oil that you use in your car? 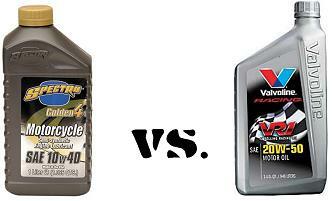 Motorcycle oil and automotive oil look and feel the same so how could there be a difference between the two? Automotive oil looks pretty enticing at $3 a quart but any experienced motorcycle rider knows that using automotive oil in motorcycles causes serious damage. In automotive vehicles, the engine is always separate from the clutch and transmission so they have separate oils for each. In automotive engine oil, there is more of what is called "friction modifiers" to help lessen the amount of friction on engine components and improve fuel economy. Of course, improving fuel economy has always been the main goal of the automotive industry; therefore, making friction modifiers a necessity for all automotive oils. These friction modifiers that are added to automotive oils are what cause serious damages when used in motorcycles. The friction modifiers clog the clutch plates in a motorcycle's transmission causing serious clutch slippage and disabling the motorcycle. Motorcycles have to be as compact as possible and to do this, the engine and transmission have to be combined together into one casing. This means that everything is lubricated by only one type of oil including the valves, piston, transmission, and clutch. To some people, both oils look and feel the same but now you know the facts of each. So the next time that you decide to change your motorcycle oil, go straight to your local motorcycle dealer and buy only high quality motorcycle oil designed specifically for the type of motorcycle you own. Make sure that you change your oil periodically to keep it fresh and clean to ensure a long life for your engine, transmission, and clutch.